I’ve developed a new morning ritual and I can’t recommend it highly enough. But you do need to live near some brambles, which – luckily for me – I do. In fact, where I live in France, it’s pretty rural, and I have immediate access to all the delights Mother Earth is currently serving up. But even if there’s more concrete than grass where you live, you can still go out on weekend ‘shopping’ trips. So, my ‘harvest bowl’. 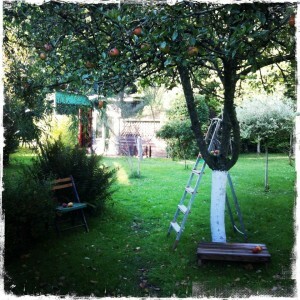 Every day it gets filled with blackberries, apples, hazelnuts and, soon, walnuts!! And the act of filling it has become my daily reminder to be grateful. Grateful for the abundance of food growing just metres away from the kitchen in which it will be prepared, and grateful for the abundance in my own life. But having a lot of fresh produce is a bit like having a lot of money – it comes with responsibility. You can’t just pick blackberries willy nilly and let them go soggy in the fridge. Or watch your apples develop that weird, waxy skin texture that signals impending decay. (The nuts, granted, do have to be left to their own devices – and when they’re ready, I have to practise moderation in the face of delirious greed!). 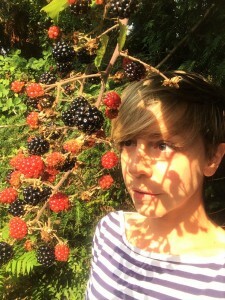 I’ve found the best way to be responsible with, and respectful towards, my harvest is to make sure it gets eaten and appreciated – by me and anyone else I encounter. And I do that by making the delicious things listed below. There’s something for everyone – unless you’re both vegan and gluten intolerant, in which case, I suggest eating your fruits, berries and nuts in all their unadulterated glory! These are quick and easy to make, tasty, filling, good for using up ageing bananas, and good for sharing. 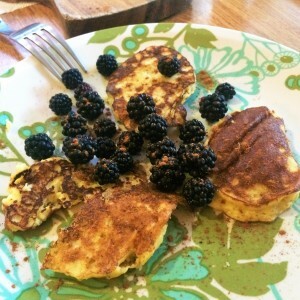 And they can be made better still by putting blackberries and cinnamon on top! They’re also classed as ‘Paleo‘, so if you eat like a caveman, you’ll like these! That’s just my playful name for what is actually a recipe by Paul Hollywood. The only things I do differently are leaving out the seaweed (that’s not a joke – he really does use the stuff in his crumble!) and using salted butter. Oh, and I like it served with crème fraiche. Naturellement. No-one can claim to have invented porridge, apart from the oats themselves. And yes, Bircher was invented by a Swiss doctor, but it is basically just a cold version of porridge. So I’m going to lay claim to these variations. You can invent your own versions, too. The ‘Bircher’ on the left contains peach. Bircher: Soak the oats overnight, in half the amount of water/milk you would use if you were cooking it in a pan – so, roughly 1:1. 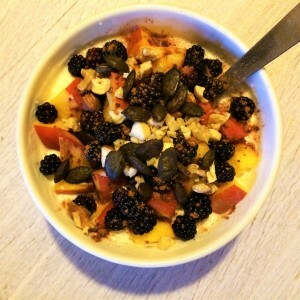 In the morning, stir in some plain yoghurt (it’s up to you how much – depends on your feelings about gloopiness), grate an apple on top, add your blackberries, and top with nuts and pumpkin seeds, either plain or made as described above. As the children fall back into their academic rhythm, as you pack away your shorts and vests for another 6 months or so, and as the last roses of Summer drop their petals in response to the dip in temperature and the lessening of light, we reach the Autumn equinox – that moment in the year when light and dark are of equal measure, and when we find ourselves on the precipice of change. It’s a time that can be very exciting – who doesn’t enjoy the prospect of a nice new pair of tights, a crackling fire, or a stomp through crunchy leaves?! But it can also be unsettling – after the heat and romance of Summer, a cold, dark winter isn’t always such a cheery prospect. But we can overcome this feeling – and indeed, capitalise on the time of the year – by mimicking nature, by finding the same balance of light and dark in ourselves. Yogis love balance, whether it comes in the form of a stable posture, an even breathing pattern (anuloma viloma is particularly helpful for establishing balance), or the avoidance of excess – the ability to make choices that serve the Self, and not the ego. Yoga teaches us to find a balance between effort and rest, elimination and assimilation, yang and yin. And in this way, yoga gives us tools for maintaining energetic and emotional balance in our lives. As the days shorten, it’s common to find our energy levels dipping. When this happens, it’s easy to reach for seemingly easy solutions – we might simply increase our coffee consumption, for example. But that only chafes against nature’s cycles. We know, really, that we’d benefit a lot more by taking a nap or going to bed an hour earlier. And we know this because it’s what our inner wisdom tells us. Our job, then, is to listen to the wisdom inside – to hear her when she tells us to slow down, speed up, resist, or pursue. According to Hindu tradition, along with many other cultures, that innate wisdom comes from the heart – and each sun salutation we do is a reminder of this. The sun is a symbol of consciousness and self-illumination, and by putting our hands in prayer position front of our hearts (anjali mudra) at the beginning and end of each sun salutation, we acknowledge that the sun, or the light, resides in all of us. Each time we practise yoga, we have an opportunity to connect with our inner light and receive its wisdom; our bodies, our minds and our choices become further refined in the laboratory that is our yoga mat. With asana, we can nourish or strengthen weary limbs. With pranayama, we can soothe an aggravated nervous system. And with the awareness of our needs that comes with these physical practices, we can learn how to meet the pressures of life – and the Autumn equinox – with equanimity. Want to walk the path together? Join us for our next Yoga Ninja workshop on September 24th! Woodcutting, like life, can be hard! Once upon a time, there was a young man with strong arms and a strong work ethic. Fittingly, he found a job as a woodcutter in a forest. On his first day, he managed to cut down an impressive twenty trees! “Not bad, lad!” exclaimed his boss (who turned the wood into planks). Determined to maintain his track record, the young woodcutter set out to do the same, if not more, on his second day. But after fifteen trees, he had to stop. On the third day, the woodcutter rose early, keen to get a head start on the job and bring his total back up to twenty. Alas, he managed to cut down even fewer trees than the day before! This pattern continued, with the woodcutter leaving work more and more disheartened as the week went on. Eventually, one of the older woodcutters took him to one side for a chat. “When did you last sharpen your axe?” he asked. The young woodcutter stared at him blankly, for he had not sharpened his axe once since starting his new job – he hadn’t had the time to spare, after all. However, the next morning, the young woodcutter remembered what his friend had asked him and set aside a few minutes to sharpen his axe, before attempting to cut down more trees. And do you know what? Despite having less time to chop wood, he managed to bring his total back up to twenty. This simple story has an important lesson for those of us who live busy, active lives. It serves to remind us about the need to sharpen our own axe. We’re speaking metaphorically, of course. 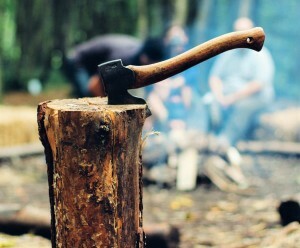 For us, the axe is three-sided: it has a physical edge, a mental edge and a spiritual edge – and it’s these aspects of ourselves that we have to ‘sharpen’. When we look at the story from this perspective, the job of chopping down trees is life itself. With a well-maintained ‘axe’ – physical strength, mental clarity and a heart full of love – we become more masterly in our approach to the job of life. Be the best woodcutter you can be! As the nights grow longer and the air becomes damp and cold, it can be tempting to hide out in our cosy homes. And yes, this is one way to sharpen your axe. But it’s not the whole story. To maintain energetic balance, a strong and vital body, and a focused mind – to keep all three edges of the axe sharp – we must come back to the mat. 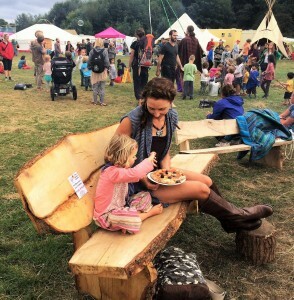 Throughout the Autumn term at Peacock Tree Yoga, we’re inviting you to commit to sharpening your blade not only in our classes, but in two special workshops being held in September and November. The first of these Yoga Ninja workshops will afford you an opportunity to take stock of where you are now – to take a close-up inspection of your axe. The second workshop, which takes place 9 weeks later, will show you how much sharper your blade has become! Well, for a start, you won’t be needing a new pencil tin to etch your name into with a compass. Nor will you be required to cover your books with posters of your favourite pop group. In a yoga class, it’s less about pens and rubbers and more about mats and eye pillows (we’ll provide you with these items in your free trial class). We don’t give out grades either; no-one is ever judged on their ability. We only want to help you to reach your highest potential – whatever that may be – and to live a joyful life in a healthy body, free of stress and suffering. 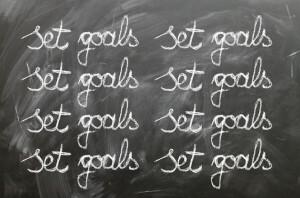 At Peacock Tree Yoga, we aim to help you reach your goals. However, we completely understand that for many people, joining a new yoga class can be as terrifying as starting primary school at the tender age of four. But we want you to feel confident about going ‘back to school’ this September – because, like these Peacock Tree Yoga students, we know what a positive impact yoga can have on people’s lives! So, with that in mind, we thought we’d unravel a few myths and misunderstandings about yoga. Already convinced about the benefits of yoga? Then register now for your free trial class! Yoga is for bendy, slim, young people. WRONG: Yoga is for everyone – and every body. You don’t start off being bendy – that comes with time, along with strength and focus. You might become slimmer – many people find that they do, with a regular yoga practice. You can become younger with yoga too – one of our favourite testimonials is “First time I’ve touched my toes in 35 years”! Yoga is a religion. WRONG: Yoga complements religion beautifully – and when we say religion, we mean any religion. Yes, yoga is integral to the Buddhist and Hindu traditions, which adopted it, but it is, in fact, a science – of the Self. 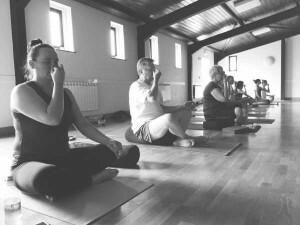 Yoga gives us techniques for uniting mind, body and spirit – including asana (postures), breathing and meditation – to help us achieve optimum wellbeing and experience the ‘oneness’ of everything! Yoga isn’t challenging enough for sporty people. WRONG: Yoga can be incredibly challenging – especially for sporty people! Have you ever tried stretching a muscle that’s more familiar with being in a state of contraction?! Or using muscles you didn’t even know you had? Well it’s high time you did, especially if you want to enhance your sports performance! Yoga is about following rules. WRONG: Yoga shows us how to use our own wisdom to make the best of ourselves and the situations in which we find ourselves. Having said that, we do ask our students to observe some Yoga Etiquette! Yoga is expensive. WRONG: Yoga is cheap when you consider the cost of having a bad back, a sport injury, or a stressful life – all of which can be alleviated or avoided with yoga. Or when you compare the cost of a class to the cost of that takeaway coffee you buy each morning, the bottle of fizz you put in the fridge for Friday night, or any other indulgence… Indulge your mind and body instead – or as well, if you must! Yoga is boring. WRONG: A good yoga class leaves you feeling invigorated, relaxed, determined, focused and, yes, happy! And at Peacock Tree Yoga, we occasionally take it further – celebrating the likes of Hallowe’en, Bonfire night and Christmas by practising in costume! Are you feeling a bit more confident about going back to school? Are you ready to make a commitment to your physical and mental wellbeing, and discovering new ways of coping with everything life throws at you? Then head over to our Yoga Essentials page for a complete break-down of what you can expect from our twelve-week course, and to find out how you can register for your FREE trial class. Still don’t believe it’s for you? Then watch at this time lapse film we made in one of our Yoga Essentials (beginners) classes – what’s not to love?! Hope to see you soon! The 2018 Peacock Tree Plank Challenge is here! can help you achieve your goals. *Google has asked us to add the following disclaimer: Results may vary from person to person.